Darby’s Farewell is a fine portrait of a working musician. 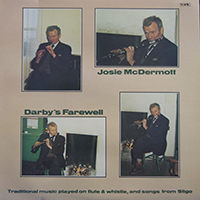 Josie McDermott was a well-known player who played across the range of Irish music – trumpet or saxophone with ‘modern’ groups and whistle or flute with ceili bands. He was an All-Ireland champion many times on several instruments and lilting, and was a finalist three times in ballad-singing. This album, recorded in 1977, focuses on his traditional repertoire.